The J/109 is more than a high-performance boat with cruiser-friendly add-ons; it&apos;s a well-conceived, well-executed dual-purpose boat that comes close to being all things to all sailors. 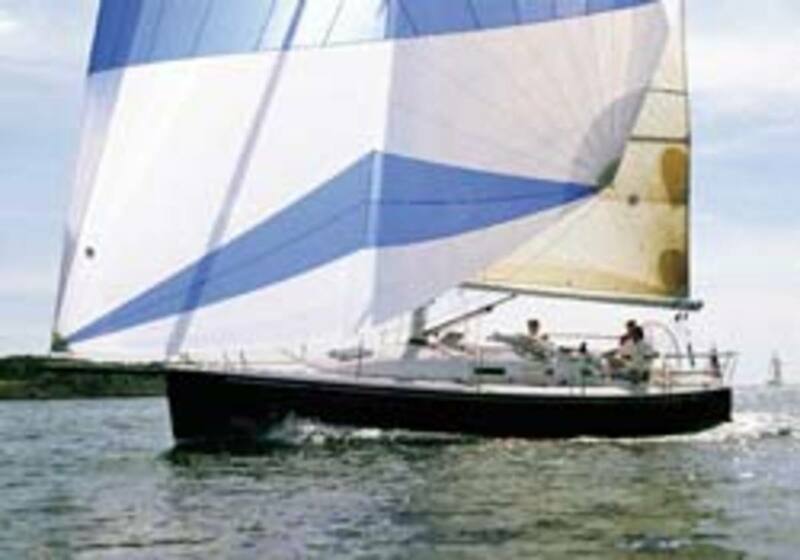 Fast, easy to handle, stable, and spacious, the J/109 can serve as a competitive racer, comfortable cruiser, shorthanded daysailer, and a family weekender. The accommodations plan includes a proper nav station with a seat back and a good-size table. Cabin berths and stowage areas are well sized, the L-shaped galley is small but efficient, and the saloon would be a comfortable place to hang out in on a rainy day. Engine access is a bit tight, and the bilge has a rather shallow sump, but handholds, ventilation, lighting, the electrical system, and the fit and finish of the varnished cherry interior and vinyl hull liner all received high marks. We liked the multi-part mainsheet system, which leads to the traveler in front of the Edson steering pedestal and makes the boat simple to sail shorthanded or singlehanded. A stern/helm seat provides on-deck stowage for cruising and can be removed and left on the dock to provide a more spacious open transom when racing. We also liked the comfortable cockpit seats and coamings, the good visibility from the helm station, the ease of moving around on deck, and especially the feel of the helm. On all points of sail during our test in light winds off Newport, the helm was a one-finger operation and razor responsive. Close-hauled, we recorded 7.25 knots of boatspeed in 10 to 12 knots of breeze. Close-reaching with the asymmetric spinnaker, boatspeed edged into the low 8s. Price: $159,900 (base, FOB Warren, RI) includes Harken hardware, Edson steering, Sparcraft aluminum mast and boom, carbon-fiber J/Sprit, Nitronic 50 rod rigging, Force 10 stove with oven, icebox, varnished cherry interior, (2) 105-amp deep-cycle glass-mat batteries. Construction: Hull and deck are laminated using the SCRIMP system with biaxial, triaxial, and unidirectional fiberglass fibers over a Baltek balsa core. Vinylester resin is used on the outer hull skin, and the hull comes with a 10-year transferable warranty against blistering.